Albert Einstein and Cosmology go hand in hand. Sure there have been some remarkable discoveries by some remarkable men since Albert Einstein released is Special and General Theories of Relativity, but the work by Einstein paved the way. He does what he wants and I like that. 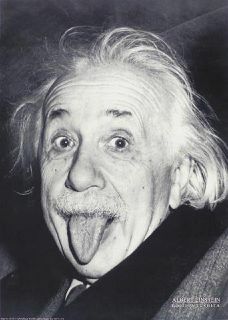 A misconception regarding Einstein's work is that while he did win a Nobel Prize, it was not because of his works in Relativity - his Nobel Prize was for the discovery of the Photo-Electric Effect. When light strikes a piece of metal, like the image above, the photon from the light are of a high enough energy to eject electrons on the surface of the metal. Why is this? Because light is also a particle and like all other particles, they interact. The limit on the speed of light is because light is also a particle. This may not make sense, but Relativity helps to explain this. A train is moving at 'x' velocity past a train station. On the train, a baby is crawling in the direction of the train. Observers in the train see the baby crawling at 'y' speed. As the train passes the train station, observers standing still see the baby moving at the speed of x + y. The idea of Relativity is that to any observer, the speed of an object depends on their time frame. I may see my friend throw a football and I can see the ball move at a particular speed. A plane flying overhead either in the direction or against the direction of the moving football will witness a different speed. One is not more correct than another, just another frame of reference. This is the essence of Relativity. Einstein, Albert. Relativity. The Special and the General Theory. Crown Trade Paperbacks. New York, 1961. Sartori, Leo. Understanding Relativity. A Simplified Approach to Einstein's Theories. University of California Press. Berkeley, 1996. Keep in mind that these changes in time and length are very minute, and any noticeable changes will only occur as that reference frame travels closer to the speed of light. Our nearest star is Proxima Centauri Alpha (Alpha Centauri) at 4.3 light years away. That means if I had a light powerful enough to reach this star, it will take 4.3 light years to get there. If I were to get on a space ship and fly to Alpha Centauri, I am now in a different reference frame with my own clock - as I reach velocities near the speed of light, I notice that it does not take 4.3 years to reach my target, it is actually less. There are two brothers that are twins. At the age of 30, one of the twins takes a cruise on a rocket that is traveling 99% the speed of light. He does this for a straight year, returning to Earth on his 31st birthday. To his surprise, his brother is 7 years older. The formula above is the formula to use if you want to determine your own reference frame. The second statement means this: if I were traveling at the speed of light, or pretty close to it (i.e. 98 to 99%), my mass would become infinite. The energy required to move infinite mass would also be infinite. Some rules of physics still apply regardless of the frame of reference. If you are traveling in a car at the speed of light, and you turn on your headlights, do they work? The answer to this question is yes - because the speed of light is the same for ALL observers, including those traveling at the speed of light.